Magniflex is one of the most interesting and quality oriented bedding specialists we have ever come across. Their passion in quality and design, focused on improving each customer's quality of life, is profound. They are quite remarkable. In the 1960's, Giuliano Magni created his first mattress in a small workshop. It was the start of a revolution: the craft skills of Prato, the world capital of fabrics, were combined with the new ideas about sleep and wellbeing. Since then, Magniflex has provided over a billion people with peaceful sleep, thanks to models and solutions designed to meet an individual's needs for comfort, relaxation, and health. To sleep well is to live better. Magniflex is synonymous with excellence. The company has always stood out from the rest because its products contain a real added value for its consumers: quality. Magniflex uses 100% Italian materials, counts on the experrtise of specialized technicians and has over 180 employees who all work closely with each other to share their know-how and passion for success. Over 50 years of history and over 100 products ranging from mattresses, bed frames, pillows, and sleep accessories. Over 35 million people worldwide sleep on a Magniflex mattress. Magniflex exports its products to 98 countries. Magniflex uses different types of materials that meet different needs but satisfy all types of specific sleep requirements. Every material is crushproof due to the extremely high quality of raw materials, which retain their characteristics over time. AJA AND UKAS: the manufacturing standards and management systems used by Magniflex comply with the directives of AJA and UKAS, international quality control organizations. OEKO TEX certification ensures that our products are free from toxic substances or any substances that are harmful to humans or the environment. GOTS (Global Organic Textile Standard) Issued by the Institute for Ethical and Environmental Certification, it certifies that all fabrics used in our Toscana collection are made with 100% organic materials. The certification ensures the maximum protection of man and the environment we live in. The Magniflex UNO Plus Power Adjustable Base. A wonderful finishing touch to add convenience and comfort to any Magniflex Mattress. The entire system is controlled with a wireless remote control. For added convenience, the system can be programmed for two preset positions. It's a great feature so you can get back to that perfect comfortable spot you found the night before with the simple touch of a button. Please scroll down to see all the details. The Dolce Vita Comfort Dual 10 Mattress, by Magniflex. The Dolce Vita mattresses are DUAL CORE; so you can have one side of the mattress firmer than the other. This mattress features the choice of being medium firm to firm. The mattresses are crafted with several layers of ultra high quality OEKO-TEX Certified premium foam. The cover is made in Natural Viscose and Outlast Fabric, and the mattress comes with a 20 year warranty. Dolce Vita mattresses range in height between 9" to 12". Generally, the thicker the mattress, the softer it gets. Please see below for greater details. The Dolce Vita Comfort Dual 9 Mattress, by Magniflex. This mattress comfort level is Firm to Extra Firm. The Dolce Vita mattresses are DUAL CORE; so you can have one side of the mattress firmer than the other. This mattress features the choice of being frim to extra firm. The mattresses are crafted with several layers of ultra high quality OEKO-TEX Certified premium foam. The cover is made in Natural Viscose and Outlast Fabric, and the mattress comes with a 20 year warranty. Dolce Vita mattresses range in height between 9" to 12". Generally, the thicker the mattress, the softer it gets. Please see below for greater details. The Doce Vita Comfort Deluxe Dual 12 Mattress, by Magniflex. The Dolce Vita mattresses are DUAL CORE; so you can have one side of the mattress firmer than the other. This mattress features the choice of being soft to medium soft. The mattresses are crafted with several layers of ultra high quality OEKO-TEX Certified premium foam. The cover is made in Natural Viscose and Outlast Fabric, and the mattress comes with a 20 year warranty. Dolce Vita mattresses range in height between 9" to 12". Generally, the thicker the mattress, the softer it gets. Please see below for greater details. 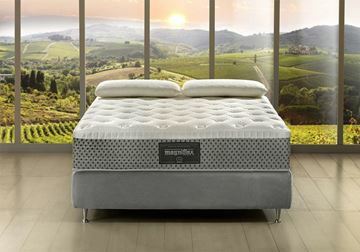 The Allegro 10" Mattress by Magniflex Italy. Features a Medium Firm Comfort Level. The Allegro 10 Mattress is made in Italy, and is crafted with several layers of ultra high quality OEKO-Tex Certified premium foam. The memory foam top layer of this mattress provides an embracing and supportive comfort level, helping to relieve pressure points while you rest. Please see below for greater details. MAGNIFLEX CLASSICO ALLEGRO GEL 12"
The Allegro Gel 12" Mattress by Magniflex Italy. Features a Medium Soft Comfort Level. The Allegro Gel 12" Mattress is made in Italy, and is crafted with several layers of ultra high quality OEKO-Tex Certified premium foam. The GEL top layer of this mattress provides a cool and enveloping comfort level, giving you supportive pressure relieving rest. Please see below for greater details.